Big Huge Games now has a bright potential future, but was once within days of destruction. Tim Train, studio general manager of Big Huge Games, held a panel at PAX East 2010 this weekend where he revealed the circumstances behind his company's near failure. By near failure, I mean at one point Big Huge Games was literally three days from extinction. Luckily, a baseball star's love for videogames and a friendly relationship from the past saved Big Huge Games, which is now working on an upcoming epic RPG alongside 38 Studios. Big Huge Games' rise and fall is related to the PC and real-time strategy game markets that began to fluctuate starting in the early 21st century. After working with Sid Meier on the Civilization series and other games like Alpha Centauri, Tim and three co-workers founded Big Huge Games in a landscape where PC was still at the top of the food chain and RTS games such as Age of Empires, Command and Conquer, and Starcraft were kings of the sales charts. The company's first title, Rise of Nations, was released in May 2003 and became a hit with critics and consumers alike, but industry change was afoot. Videogame budgets were ballooning, as were the sizes of development teams, and console sales were starting to overtake PC. In 2005, World of Warcraft went from 750,000 subscribers to 5.5 million, and the Xbox 360 made its way to retail. Big Huge Games' second release, May 2006's Rise of Legends, arrived in a very different market than its first, and sold 1/3 as many copies despite a bigger budget, bigger team, and positive average review scores. Train admits that it's possible Legends was not a product of the same quality as Rise of Nations, but it still remains that the videogame industry was now different from that of the late 90s and early 2000s. Microsoft canceled its deal with Big Huge Games for Rise of Nations 2, but the company stayed alive by putting out Catan on Xbox Live Arcade and working with Ensemble on Age of Empires III: The Asian Dynasties. Elder Scrolls III and Elder Scrolls IV designer Ken Rolston came out of retirement specifically to work for the Big Huge team, as he liked the studio's development culture, which enabled Big Huge Games to make a deal with THQ to develop an RPG, followed by THQ acquiring the studio in 2008. Everything looked grand for Big Huge's near future. However, 2008 was an awful year for THQ, whose stock value plummeted as the Dow Jones average halved. THQ was forced to sell Big Huge Games or close the studio down, and Train started to run out of options. Former Civilization II tester and friend of Train's, Jen MacLean, now working at baseball star Curt Shilling's 38 Studios, learned of Big Huge's troubles and put circumstances in motion to get her company involved. With only a few days left until THQ had to shutter Big Huge Games for good, Shilling made the call to say that he was going to save the studio. 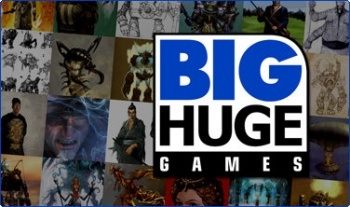 Big Huge Games is now working on an RPG set in 38 Studios' Copernicus universe. Though happy to still be in the game industry, Big Huge Games was forced to layoff a significant chunk of employees in what Train calls the worst moment of his life. While many rail the current state of DLC, Train also pointed out that DLC can be the saving grace of a studio. When a product ships with 80 people working on it, those 80 people suddenly run out of things to do. Train says that DLC keeps an entire team busy and working, and its development culture alive, even while a new project begins. DLC could be saving studios that otherwise may have failed as Big Huge Games nearly did, unless that DLC happens to already be on a game's retail disc, of course.